That last illustrated cover on the 'Early Ideas' page had brought out a major problem. The images so far lacked energy and excitement, and came across as flat, with no 3-dimensional quality. So Erica and Sarah did some more thinking with Cathy, and came up with an altogether more dynamic set-up. Cathy continues the story.. "It was felt I needed a laneway leading away with the characters running away from the viewer. 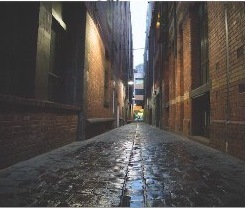 "I started looking for a cobblestoned alleyway to use as a location. "It needed to look Victorian enough - not too many modern buildings and have a lamppost as I need a light source as I was not going to be able to bring a generator and lights. "After about 3 afternoons of walking around the inner city I finally found it! "I showed it to the photographer Pippa Wischer and explained the effect I was looking for. She got a high speed camera that could cope with low light situations. We need to shoot with available light - so it needed to be timed just right. It had to be shot in the twilight just as the lights came on and before it got totally dark. I suggested shooting from a low angle to make the scene more dramatic. 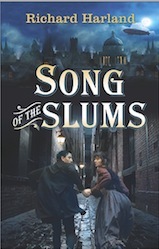 "I knew that it would add atmosphere to have the light reflecting off wet cobblestones. It rained that afternoon, but the cobblestones dried quite rapidly - in about 10 minutes! We got about 8 large bottles of water, but it wasn't enough. There were a few deep puddles in the cobblestones so I got a cup and started to scoop that water up to splash that on the cobblestones. The water was rather dodgy, and as I had to scoop more, the water got smellier and smellier! I think it started to smell like an authentic slum lane by the end of the shoot! Eeew!" That's my favourite bit of the story - and Cathy told me she had to buy a bottle of hand sanitizer afterwards! How about that for devotion to art? She also said they only had a half-hour window to take the shots, because the light wouldn't have been right before or after. "Pippa set up the camera on a tripod about 2 feet off the ground and got the focus set. Then my friends Shane and Jennie who kindly offered to dress up and model for me would join hands and start to run from behind the camera down the lane." "They dashed down the lane again and again being with the camera on motor drive - this enables a very fast sequence of shots to be taken." "I also got Pippa to shoot some photos of the lane from the same angle etc without people, so I could place the people as required in the empty lane if I needed to. Also to use as a background for the back cover. "So, I got the photos, then selected a few that looked the best and started working on them in photoshop. I actually chose the best figures, cut them out in photoshop and placed them on the lane. "I adjusted the colours by creating 3 layers of each shot - one toned as more blue and another more grey, then another lighter and more yellow to highlight the areas of lamplight. "I found a pic of a gaslight and used this to replace the existing more modern lighting. "One of these concepts was chosen at the cover meeting and shown to the author - who said that the characters were all wrong." Ulp! That was me, being a pain! I really felt strongly about it - and felt badly about having to say so, because it was nothing to do with the cover artistically. I thought the cover was absolutely brilliant in itself. 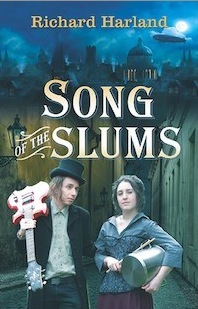 It's got everything, movement and energy, beautiful colour and lighting, Victorian atmosphere. My problem was the two models. They really had managed to look as Victorian as two characters could possibly look - they were just superb in that respect. 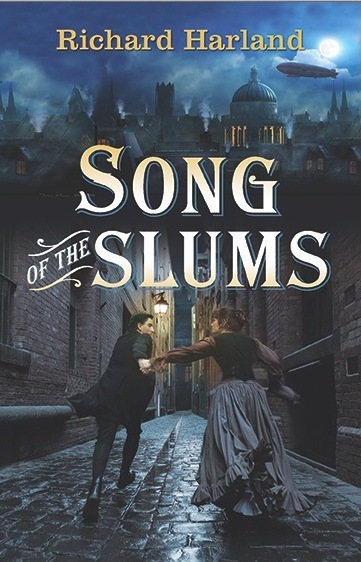 But the other side of the marketing equation is that I wrote Song of the Slums as YA/adult crossover and it'll be marketed in the first place to YA readers. Would anyone under the age of 20 identify with those two characters? Especially Astor, who looks almost matronly in her full-length dress? Astor in the novel is young, slight - and in the end. very spunky. So, after all the hard work achieving the Victorian atmosphere, here was the author speaking up for, well, the Sales and Marketing department. For purely practical considerations, I wanted to throw the lever the other way - not so much Victorian atmosphere after all! I still feel bad about rejecting it - I'd be feeling even worse if the final version had lost any of the qualities that made the first version so great. Around this time Cathy probably felt like killing me.